Commemorative activities to mark the Centenary of the Battle of Beersheba are being organised at Armidale NSW. This battle occurred on 31 October 1917 when Beersheba was captured and the British Empire forces were able to advance into Palestine. Organisers are looking for relatives of men who fought at Beersheba and who might be interested in sharing information and or attending the Commemoration. 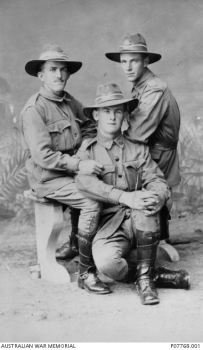 Known Inverell district men who fought during this battle are Cecil Grove, Alexander Thomas McClymont (both KIA), Cecil James McClymont, Quarter Master Harvey McGregor, Sgt William Salmon, Luke Bice, Lewis Eyre, Cecil H McDonald, and Bingara boys Charles Doherty and Michael James Madden. No doubt there are many more.